One reason to use a daily page is to actually make a plan for the day. But that does not mean that you need a cluttered schedule, where you might overlook important times. Instead, I propose that you write the essentials in a schedule and the details in the other parts of the daily plan (as seen here on my Quo Vadis daily page). The green Ws indicate where I scheduled 8 hours of work and put a small arrow, to indicate that the details are listed in the meat of the page. The three tasks, like "draft policy," indicate what needs to be done in those 8 hours. TIP: Use a tiny arrow to indicate where the details are located away from the actual schedule. The Ps (for personal) show what time I need to do an errand (which cannot be done earlier in the day because the pharmacy won't have Crestor ready until late in the day). 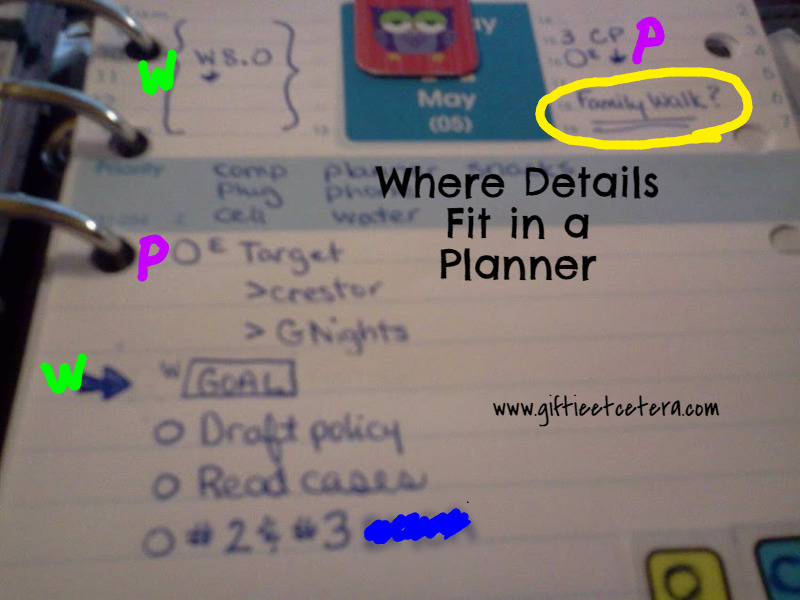 The details of the errand are in the middle of the page, where actual planning gets done. Again, a tiny arrow next to the scheduled time indicates that I should look below to find the details. This method can work with virtually any daily set-up. It just makes sense. I could have crowded the schedule with details and times, but this way, CP (carpool) jumps out at me. My 8 hours must be done before or after CP. There is no other option. Notice that I do put some questionable activities, like a family walk, with a question mark on the schedule (circled in yellow). I hope to walk, if we don't have an afternoon thunderstorm!